Gene’s Derby Day was not very enjoyable. Back in 1972, Hollywood released a very popular movie that was entitled: “The Poseidon Adventure.” For those of you old enough to remember, you may know where I’m headed. For those of you that are not, then you can either go see the movie real quickly or try to read between the lines. In short, the movie was about an ocean cruise ship that ran into some stormy weather, and, eventually, the liner found itself upside down and the passengers found themselves staring at the bottom of the deep waters. Needless to say, not a good situation. Truthfully, the day didn’t start off too badly. My pick in the 6th, (The Grade 1 Humana Distaff), Carina Mia, ran a game third in her first start of the year – after missing the break just a hair. But we had the exacta boxed with the first two finishers, too, and so we managed to survive and move on. In the 7th, my “double dot” horse, Roca Rojo, got up in the final stride to win the Distaff Turf Mile. Low odds. Missed the exacta, which ticked off one of my cats, Birdie, since the place finisher was named Believe in Birdie. He is kind of a finicky feline to begin with, and now he won’t even talk to me. Cats. But a win is a win. OK. Not bad. On to the 8th, the Grade 3 Pat Day. I had the 9, Excitations. I watched this talented colt breeze before he ever ran. The first time out of the starting gate, I bet him good. Real good. He ran a game second, but lost the head bob to Girvin (more on him later). But Excitations won his next start and after a try at two turns, he won again at Keeneland in impressive style. I couldn’t wait until he ran again. Excitations didn’t break well. It appeared that he didn’t like the mud slapping him in the face, but, then again, who does. And, he ran a very green and uninspiring race. Yet, not to worry. I spread out in this race, trying to cover with five other horses. Alas, I didn’t have a single penny on Wild Shot and jockey Corie Lanerie, who splashed away to an easy and impressive win. Darn to heck. It went downhill from there, about like the water running up and over the shoes of those caught outside the last two days. Oscar Performance was not award-winning or inspiring in the Grade 2 American Turf, won by Mike Smith and Arklow. Masochistic, true to his name, ran even worse in the Grade 2 Churchill Downs, captured by Limousine Liberal (I have to admit I do like the name selected by owner K.K. Ball). Wheels off. Thank God for ATMs (I guess). Needless to say, not a good situation. But as soon as we replenished, I looked up and saw my good friend, Buff Bradley walking over from the backside with his 5-year-old son of Kitten’s Joy, Divisidero. Over the previous four years, Buff had won a race on Derby Day three times – including a year ago when Divisidero won this very same race – 2016 edition. Hope sprang eternal. And, both Buff and Divisidero delivered. Again. Despite hovering at the back of the pack all the way until the top of the stretch and despite encountering one traffic issue after another, Divisidero finally got a free chance to run and he that’s exactly what he did. Run. He swept past the field in shocking style and won. I couldn’t believe the bettors let him off at 7-2 odds. Was that a life raft I saw bobbing in the waters, captain? The 143rd running of the Kentucky Derby wasn’t my best performance. In fact, I kind of handicapped this one like Thunder Snow ran. He thought he was in a rodeo, bucking and squealing as soon as the gate opened. (The colt is OK, by the way. This is the quote from Dr. Keith Latson, AAEP On Call Veterinarian: “Thunder Snow galloped back to the paddock comfortably under his own power. He was examined by Dr. Jennifer Kaak and was found to have no injuries and walked back to his barn under his own power.”) And, my para-mutel tickets were bucked off. I had won the Oaks on Friday (you may have heard since we celebrated like Charlie Sheen). 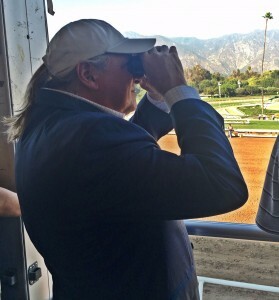 I had bet more than a few dollars on the Oaks-Derby double. I was alive with Abel Tasman and six horses in the Derby. Six horses. I was alive a lot with my favorite horse, McCracken. McCracken was roughed up at the start, sustaining cuts on his left hind leg, but he ran on gamely – getting all the way up to what appeared to be fourth at one time – before flatting out. The other five faltered. I didn’t have a single horse in the top 3. My buddy and business partner, Cecil Watts, cooked me a great steak dinner. That had a retail value of well over $150, so I can credit that as a win. He tried to console me, which saved me another hour with the brain doctor, retail value $250. And, he jokily laughed that he was going to set up a Go Fund Me account. Laughter = $1,000, let’s say. “Oh, can’t you see the morning after? The title and theme song to “The Poseidon Adventure.” Sung beautifully by Maureen McGovern. I have it in my ITUNES. He borrowed my pen and wrote it down.